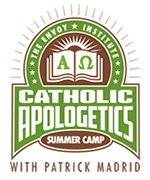 The 4th Annual Catholic Apologetics Camp is planned for the summer of 2013, August 8-14. The Envoy Institute under the direction of Patrick Madrid, is doing the programing. Knowing your faith, knowing the person at the center of your faith, Jesus Christ, is SO VERY crucial at every stage of life, including the time you spend at college. We need to form and inform the next generation of Catholics to propose the truth and beauty of the Faith! Make a suggestion to a senior in high school to participate in Apologetics Camp. Jennifer Fulwiler's article on the camp can be read here. Have a spare $50.00, why not make a donation to the Apologetics Camp???? Any thing you can spare is greatly appreciated! The Prefect of the Congregation for the Doctrine of the Faith, Archbishop Gerhard L. Müller, addressed the Pontifical Academy of Life on 22 February 2013. It was the annual meeting in Rome. Müller's talk didn't shatter too many windows by unearthing new problems, nor did it break new ground in the Church's teaching. Müller gives a brief assessment of the situation and that we have gone off the tracks in some ways. He does, however, shed light on the fact that we need to take more seriously our moral and faith formation and to put in the time doing the hard work to know the issues and how to respond to them according the parameters of the Catholic Faith. Too often we are afraid to do the hard work. And that's the ministry of the Prefect: to illumine and offer a corrective. Archbishop Müller did challenge, to a degree, the theological professorial establishment, even if the talk may be seen a bit anemic. Continue reading CDF Prefect rehearses work at hand for moral formation, dignity of the person. The Catholic Moment is over ... where does hope exist? The news media is hot to assess the Church and her legacy in the wake of Benedict XVIs abdication announcement on February 11, 2013. And, to be honest, much of the assessment is tedious and lacking substance, even from veteran and well-known and reliable Catholic thinkers. No shortage of prattle. Pick up the daily paper or turn on the TV/radio news and you will be treated to comparisons and rumination between the still current papacy (the Pope is not gone yet) and the previous one but too often with secular criteria and interests. Judging the pope and the Church with criteria other than a focus on God and the proclamation of the Gospel is not faithful. The media, we have to recognize, is not too conversant in matters of Catholic faith. In fact, they generally so very little and merely repeat clichés. Far more people are interested in questions of power, authority, the teaching, the numbers of faithful, "successes" and "failures," the position of "the pope who resigned" and the like than they are in matters pertaining to the Word of God, the salvation of souls and to eternal life. Perhaps in the days to come we can come to a new and vital interest in the substance of the faith than in power. In today's mail I received my copy of George Weigel's latest book, Evangelical Catholicism: Deep Reform in the 21-Century Church (Basic Books, 2013). I am already pleased to read a very fine book on the needs of the flourishing of Catholicism again in an era of significant discord viz. the Faith. I hope many will pay attention to what Weigel has to say. 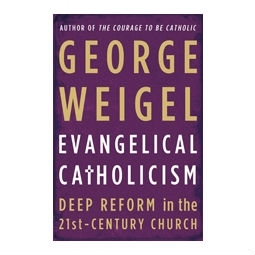 Weigel's pointing to a niche Catholicism that's only now gaining currency in Catholic places. "Niche" in the sense that Catholics are now adopting an approach, a method, a manner of proposing the Truth that is more associated with Evangelical Christians than with Catholicism. We don't always have the confidence and vocabulary to make the Christian proposal to others (to Catholics and non-Catholics alike). But if you think about, we've always been evangelical but we've been shy to share our faith with others in meaningful ways. Certainly an evangelical approach is Catholic and is being picked up once again as a valid and faithful way of living the Truth. Perhaps our priests, religious, faith formation directors and not a few members of Roman Curia will see this light. It is not lost, however, on Pope Benedict XVI who has espoused an approach to the faith with his great emphasis on the new evangelization and the calling of the Year of Faith. Even some circles of the Orthodox Church have looked to evangelical ways as good and helpful. "The internal dynamics of he Church itself, attentive tot eh promptings of the divine Bridegroom and the unique challenges posed to the Great Commission by late modernity and post-modernity, have, together, impelled a new evolution in the Church's self-understanding and self-expression. The result of that evolution, Evangelical Catholicism, is an expression of the four enduring marks of Christian ecclesial life --unity, holiness, catholicity, and apostolicity." You need to read Deuteronomy in this way: distance yourself from distractions and choose life: life in God; life in the communion of the Trinity. What is clear about Evangelical Catholics insistence on Catholics distancing themselves from confused thinking and acting, being more focused and less mediocre, to work for concrete unity both interiorly and exteriorly, and not to fear persecution. Continue reading Weigel's Evangelical Catholicism: Deep Reform in the 21st-Century Church. Ross Douthat "conservative columnist" of The NY Times writes about Pope Benedict's resignation yesterday. He pinpoints how in recent years, in many ways very recent years, how the ministry of the Bishop of Rome has changed. And not for the better. In The Pope Abdicates, he puts his finger on things Benedict tried to minimize: the cult of papal personality, a globe-trotting bishop, a world-powerful CEO, an international voice of reason, etc. The real power of the Pontiff is work of unity among all peoples and teaching and living the truth: Jesus Christ is true for all people because He is the Way, the Truth and the Life. There are beautiful and positive lessons to be learned with Benedict's resignation. God knows what he did when he gave Ratzinger the responsibility of being the Bishop of Rome. The challenges of a global Church worshiping the One, Triune God, preaching salvation, dispensing forgiveness of sins, being an example of love for the other, living according to the Magisterium, and the like, led by an 85 year old are very burdensome today. The humility of Benedict, who in good conscience likely did as much in 7 years as John Paul did in 26 is amazing. But you have to read this work to know this. His homilies and his talks are crucial to know his current thinking and direction. Take for example, Benedict's 2005 address to the Roman Curia. A lesson to study is how focussed are we on God? Is God our true center? Do we believe that Jesus is the center of our Church, or is the real head a man in nice clothes? Sentimental we can't afford to be: there is something important at stake here: salvation. Even without the office, Benedict remains a true Father of the Faith. Be sure to have enough sleep and at least have eaten one meal today before you read and give some serious consideration to what Father George Rutler, pastor of the Church of Our Saviour (NYC) has to say about the death penalty. A recent essay was published today in Crisis Magazine online. MOST Catholics, the informed and untrained, have no idea what the Church teaches about the subject. Many will recall that Pope John Paul II taught in Evangelium vitae (1995) and that he frequently spoke against the death penalty and it was the subject of intervention when he would visit a country where the death penalty was utilized (think of his visit to Missouri). A papal encyclical doesn't change the teaching of the Church; it is however authoritative and it needs to be received. The matter of what level teaching an encyclical is, and to what degree it would bind conscience. For our purposes here, let's say that a papal encyclical is authoritative and it involves the virtue of prudence but that it doesn't contravene but it does nuance the teaching of the Church. Prudential judgment is just that, prudential. The Pope never changed the teaching of the Church. The blessed pope did try to reorient our thinking and the practice of killing legitimately convicted criminals. Remember, too, several years the heated debated between Cardinal Avery Dulles and Justice Scalia on the subject in First Things? Father Rutler's article is helpful in giving us yet another understanding of how we might understand the death penalty. Do we actually accept Christian belief in the salvation of one's soul, that is, do we want to go to heaven? Read the article with openness, with a critical mind. As Saint Ignatius would teach, approach with the best of intentions to truly understand the other person. Knee jerk reactions are unacceptable for a Catholic who holds the integration of faith and reason. Father Rutler's argument is Catholic on all levels. Capital punishment does not inspire roaring humor in healthy minds, so wit on the subject tends to be sardonic. Two of the most famous examples, of course, are: "In this country it is wise to kill an admiral from time to time to encourage the others," and "Depend upon it, sir, when a man knows he is to be hanged in a fortnight, it concentrates his mind wonderfully." The first, "pour encourager les autres," is in "Candide" where Voltaire alludes to the death by firing squad of Admiral John Byng in 1757 for having let Mincorca fall to the French. The second was Samuel Johnson's response to the hanging of an Anglican clergyman and royal chaplain William Dodd for a loan scam. Byng's death was the last instance of shooting an officer for incompetence, while Dodd's was the last hanging at Tyburn for forgery. Dodd's unsuccessful appeal for clemency was ghostwritten by Dr. Johnson. Continue reading Hanging Concentrates the Mind. This page is a archive of entries in the Faith & Reason category from February 2013. Faith & Reason: January 2013 is the previous archive. Faith & Reason: March 2013 is the next archive.